I've almost called last Sunday's Run for Pasig River the run that wasn't. With -- read: 79,000 runners in attendance at the Quezon City Memorial Circle, there wasn't only heavy vehicle buildup at as early as 5:00 am, foot traffic was also unimaginably shoulder-to-shoulder that it took my cluster roughly an hour just to get to the starting line. It was almost impossible to run. But thankfully, there were tiny opportunities called spaces that allowed me to zigzag through the thick crowd, consisting mostly of students and corporate volunteers. 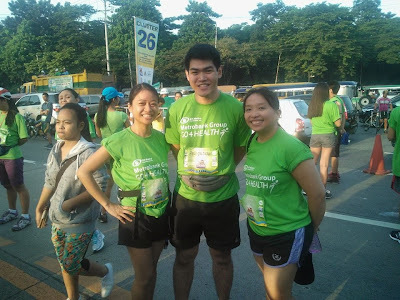 Then there were my fellow runners from the Metrobank Group who cannot be missed in their bright green shirts. Seeing a runner or two from our Group would inspire me to go on a little faster every time the conditions seemed tough. At points where the crowd was really thick and dense that I just had to walk with everyone else, our solidly synchronised women and men from the Armed Forces of the Philippines helped me break through. It also helped that I kept a focused mind. 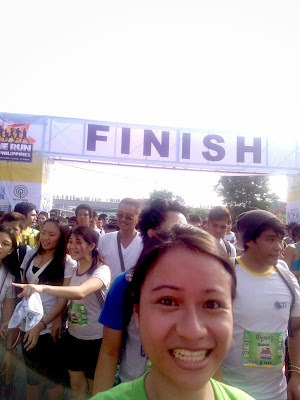 My goal was not just to finish the finish line; for once, I wanted to be able to say that I have run -- and not just walked -- for the Pasig River after two failed attempts in 2010 and 2011 due to personal emergencies. Today, I am glad that finally did. Despite the sun, sweat and stench, I made through 5k in approximately just 37 minutes.